What Is Your Tolerance for Investment Risk? When you think of risk in your investment portfolio, you may think of volatility (how much your investments go up and down). Most people do. However, risk is more accurately defined as the probability that you won’t achieve your personal or financial objectives. Check out the Risk Tolerance Questionnaire, which contains a series of questions designed to help you identify just how much risk you’re willing and able to take in order to achieve your objectives. Answer the questions and then reflect on your responses. What do they tell you about the amount of risk you can tolerate for any amount of time? 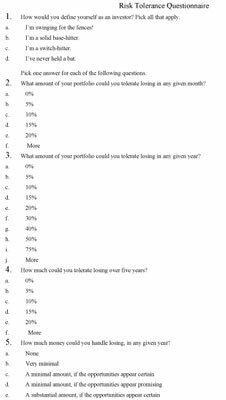 Click here to download and print the Risk Tolerance Questionnaire. If you aren’t sure how to answer a particular question, check out the Drawing Conclusions from the Risk Tolerance Questionnaire worksheet, which lists observations and potential conclusions that correspond to the eight risk tolerance questions, so that you can gauge or evaluate your answers. 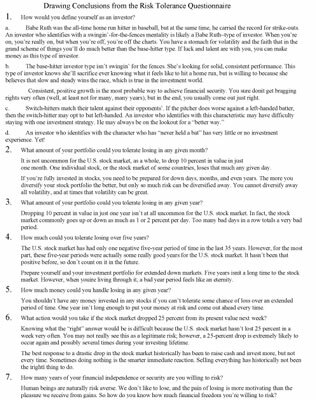 Click here to download and print Drawing Conclusions from the Risk Tolerance Questionnaire. If you’re currently investing in the stock market, how did you feel during recent periods of market fluctuations? What is your comfort level with managing your own portfolio? You should take all of these issues into consideration to determine your investment risk tolerance.